Nobody had stolen the sound of my footsteps. 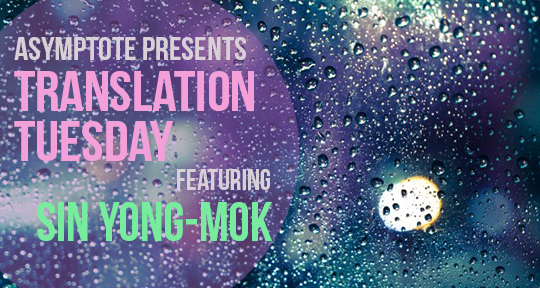 Today we bring you a poem from a lauded South Korean poet, Sin Yong-Mok, in a translation by Brother Anthony of Taizé that is sensitive to the sonorous aspects of Sin’s lines. If you enjoyed this, be sure to check out the poetry section in the Winter 2018 issue of Asymptote. God used up all the summer heat trying to sew the sound of rain inside rain. It was morning when, in order to retrieve one raindrop dropped by mistake, mists roamed the ground. If there’s a leaky roof the water may be an abraded stone. I enabled that stone to hear a sound of footsteps. One day at an estuary I happened to pick up one raindrop. Nobody had stolen the sound of my footsteps.